BARRY’S BAY – The Opeongo Snowbirds Snowmobile Club will soon be getting a shiny, new grader from the Ontario Federation of Snowmobile Clubs. President Cheryl Reid said she found out about the news on January 14. The Prinoth Husky groomer is worth around $200,000. The local snowmobile club, which is responsible for the maintenance and grooming of the region’s trails, was utilizing a used groomer and a used, borrowed groomer. “We had a lot of unexpected repairs to the equipment at the beginning of the season, which is a catch 22. Permit sales are down, and we have repairs that need to be done on the equipment to get it out on the snow, but we don’t have the money,” she said, throwing her arms up in the air. As of January 18, only 120 permits have been sold, compared to the 175 budgeted by the local club. This is putting a serious dent into the club’s budget, which covers equipment breakdown. But Reid remains optimistic with the accumulation of snow received last week, and hopes that will drive the permit sales up. Now that the new groomer is coming, those repair expenses will not be as high for quite some time. “It will help out a tremendous amount,” she said. According to OFSC’s website, the Government of Ontario injected the province-wide snowmobile network with $400,000 for the 2011/2012 Industrial Groomer Fund. The money went along with the OFSC’s contribution of $600,000, which goes towards the purchase of new groomers and the refurbishment of existing ones. 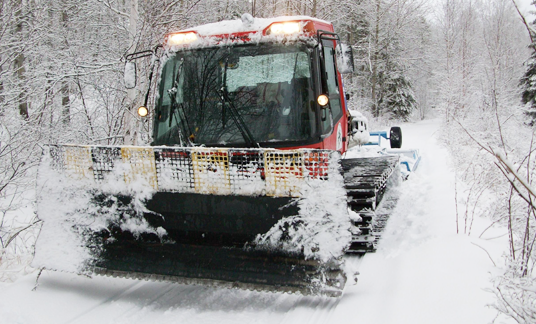 There are over 340 groomer units in the OFSC provincial fleet that put on over 100,000 hours collectively each winter. Groomers are deemed most efficient for the first 10 years of their life. When they climb that age, the OFSC reports that they operate only 50 to 75 per cent of the time due to down time from major repairs. The trail system in the Opeongo Snowbirds region spans from Whitney to Wilno and everywhere in-between. Reid said the groomer should be arriving locally in two weeks from now. She added the club should get 20 years of use out of the machine. In the meantime, the club will continue using the loaner groomer and the other older machine in its fleet. With good news comes bad news, however. According to a press release sent out by Crime Stoppers, sometime within the last three weeks, someone has removed approximately 15 OFSC signs and metal posts from the B-trail between Aylen Lake and Barry’s Bay, as well as on trail 155. So not only is the thief stealing a sign, they are potentially shutting down a trail, thus potentially losing business for the area. Every time the groomer goes out, the operator checks the signs and replaces stolen ones accordingly. To add to that stress, the OFSC sign audit team will be coming through the area sometime in the next couple of weeks. Volunteers are completely responsible for the signs. Since many hold full-time jobs and don’t complete the grooming until later on at night, the theft of signs poses a major safety risk for snowmobilers. Anyone with information on the thefts could receive an award of up to $2,000 from Crime Stoppers. To report a crime, call at 1-800-222-8477 or visit www.valleytips.ca.